Greets, folks! Check it out: Guile had a whole track devoted to it at FOSDEM this year. OK, so it was only half a day, but there were like a dozen talks! And the room was full all the morning! And -- get this -- I had nothing to do with its organization! I think we can credit the Guix project with the recent surge of interest in Guile; fully half the talks were from people excited about using Guix to solve their problems. Thanks very, very much to Pjotr Prins for organizing the lovely event. I gave a talk on how the Guile 2.2 compiler and virtual machine could change the way people program. Happily, the video recording came out OK! Video below (or here if that doesn't work), and slides here. The time was super-limited though and I wasn't able to go into the detail that I'd like. So, dear readers, here we are, with a deeper look on lambda representation in Guile. If you answer, "it's a lambda expression", you're right! You're also right if you say it's a function -- I mean, lambda makes a function, right? There are lots of things that you could say that would be right, including silly things like "twenty-two characters set in an awkward typeface". But if you said "it's a closure" -- well you're right in general I guess, like on a semantic what-does-it-mean level, but as far as how Guile represents this thing at run-time, hoo boy are there a number of possibilities, and a closure is just one of them. This article dives into the possibilities, with the goal being to help you update your mental model of "how much do things cost". Let's look into these one-by-one. If Guile can prove that a lambda expression is never reached, it won't be present at run-time. The main way this happens is via partial evaluation, but later passes can do this too. In the most basic example, consider the lambda bound to f by this let expression. Here again the lambda is gone, but not because it was unreachable, but because it was inlined into its use. I showed some intermediate steps as well, just so you get a feel about how partial evaluation works. The inlining step is illustrated by the fourth transformation, where the lambda application went away, replaced by its body. The partial evaluator in Guile 2.2 is more or less unchanged from the one in Guile 2.0, so you get these benefits on old Guile as well. Building a good intuition as to what the partial evaluator will do is important if you want to get the best performance out of Guile. Use the ,optimize command at the REPL to see the effects of partial evaluation on any given expression. It's a little loop that builds a list of integers. The lambda in this loop, bound to loop, will be contified into the body of count-down. To see that this is the case, we have to use a new tool, ,disassemble (abbreviated ,x). This takes a procedure and prints its bytecode. It can be hard to understand, so I'm going to just point out some "shapes" of disassembly that you can recognize. However, what we see in the disassembly is the body of the loop: we cons something onto a list (the cons), check if a two numbers are equal (br-if-u64-=-scm), and if they are we jump out of the loop (L2). Otherwise we subtract 1 from a number (sub/immediate) and loop (br to L1). That is the loop. So what happened? Well, if inlining is copying, then contification is rewiring. Guile's compiler was able to see that although it couldn't inline the loop function, it could see all of loop's callers, and that loop always returned to the same "place". (Another way to say this is that loop is always called with the same continuation.) The compiler was then able to incorporate the body of loop into count-down, rewiring calls to loop to continue to loop's beginning, and rewriting returns from loop to proceed to the continuation of the loop call. These words like "contification" and "continuation" might be unfamiliar to you, and I sympathize. If you know of a better explanation of contification, I welcome any links you might have. The name itself comes from a particular formulation of the intermediate language used in Guile, the so-called "CPS" language. In this language, you convert a program to make it so it never returns: instead, each sub-expression passes its values to its continuation via a tail call. Each continuation is expressed as a lambda expression. See this article for an intro to CPS and how it relates to things you might know like SSA. Transforming a program into CPS explodes it into a bunch of little lambdas: every subexpression gets its own. You would think this would be a step backwards, if your goal is to eliminate closures in some way. However it's possible to syntactically distinguish between lambda expressions which are only ever used as continuations and those that are used as values. Let's call the former kind of lambda a cont and the latter a function. A cont-lambda can be represented at run-time as a label -- indeed, the disassembly above shows this. It turns out that all lambda expressions introduced by the CPS transformation are conts. Conts form a first-order flow graph, and are basically the same as SSA basic blocks. If you're interested in this kind of thing, see Andrew Kennedy's great paper, Compiling with Continuations, Continued, and see also CPS soup for more on how this evolved in Guile 2.2. I say all this to give you a vocabulary. Functions that are present in the source program start life as being treated as function-lambdas. Contification takes function-lambda values and turns then into cont-lambda labels, if it can. That's where the name "contification" comes from. For more on contification, see MLton's page on its contification pass, linking to the original paper that introduces the concept. Contification is a reliable optimization. If a function's callers are always visible to the compiler, and the function is always called with the same continuation, it will be contified. These are two fairly simple conditions that you can cultivate your instincts to detect and construct. Contification can also apply to mutually recursive functions, if as a group they are all always called with the same continuation. It's also an iterative process, in the sense that contifying one set of functions can expose enough first-order control flow that more contification opportunities become apparent. It can take a while to get a feel for when this optimization applies. You have to have a feel for what a continuation is, and what it means for a function's callers to all be visible to the compiler. However, once you do internalize these conditions, contification is something you can expect Guile's compiler to do to your code. The next representation a lambda might have at run-time is as a code pointer. In this case, the function fails the conditions for contification, but we still avoid allocating a closure. Here's a little example to illustrate the case. ;; If `log' is too short, it will be inlined. Make it bigger. So, good. We defeated the inliner. Let's look closer at the disassembly of the outer function. Here we see that instead of the generic call instruction, we have the specific call-label instruction which calls a procedure whose code is at a known offset from the calling function. call-label is indeed a cheaper call than the full call instruction that has to check that the callee is actually a function and so on. But that's not the real optimization here. If all callers of a function are known -- and by this time, you're starting to catch the pattern, I think -- if all callers are known, then the procedure does not need to exist as a value at run-time. This affords a number of optimization opportunities. Theoretically there are many -- all call sites can be specialized to the specific callee. The callee can have an optimized calling convention that doesn't have anything to do with the generic convention. Effect analysis can understand the side effects and dependencies of the callee in a more precise way. The compiler can consider unboxing some arguments and return values, if it finds that useful. In Guile though, there's only one real optimization that we do, and that is related to free variables. Currently in Guile, all procedures have a uniform calling convention, in which the procedure being called (the callee) is itself passed as the zeroeth argument, and then the arguments follow on the stack. The function being called accesses its free variables through that zeroeth argument. If however there is no need for the procedure to be represented as a value, we are free to specialize that zeroeth argument. So, consider a well-known procedure like log above. (By "well-known", we mean that all of log's callers are known.) Since log doesn't actually have any lexically bound free variables, we can just pass in anything as argument zero when invoking it. In practice we pass #f, because it happens to be an easy value to make. For a well-known procedure with only one free variable, we can pass in that free variable as the zeroeth argument. Internally to the function, we rewrite references to that free variable to reference argument 0 instead. This is a neat hack because we can have a lambda with a free variable but which results in no allocation at run-time. Likewise if there are two free variables -- and this is starting to sound like Alice's restaurant, isn't it -- well we do have to pass in their values to the procedure, but we don't have to build an actual closure object with a tag and a code pointer and all. Pairs happen to be small and have some fast paths in Guile, so we use that. References to the free variables get internally rewritten to be car or cdr of argument 0. For three or more free variables, we do the same, but with a vector. For a final trick, a set of mutually recursive procedures whose callers are all known can share the object that collects their free variables. We collect the union of the free variables of all of the procedures, and pack them into a specialized representation as above. Note that for well-known procedures, all variables that are free in the lambda are also free in the caller; that's why the 1-free-variable substitution works. The lambda is bound in a scope that dominates its callers, but its free variables dominate the lambda so they dominate the callers too. For that reason in this case we could choose to do lambda lifting instead, with no penalty: instead of bundling up the free variables in a heap object, we could pass them as arguments. Dybvig claims this is not a great idea because it increases register pressure. That could be true, but I haven't seen the numbers. Anyway, we do the flat closure thing, so we pack the free vars into data. All these ideas came pretty much straight from the great Optimizing Closures in O(0) Time by Andrew Keep et al. OK! So you have a lambda whose callees are not all visible to the compiler. You need to reify the procedure as a value. That reified procedure-as-value is a closure: an object with a tag, a code pointer, and an array of free variables. Of course, if the procedure has no free variables, you just have the tag and the code pointer... and because Scheme is semantically squirrely when it comes to the result of (eqv? (lambda () 10) (lambda () 10)) (it's unspecified: lambda expressions don't have identity), we can statically allocate the closure in the binary, as a constant. Otherwise we do allocate the heap object. Note however that if a group of mutually recursive procedures has just one entry that is not "well-known", then that procedure clique can share one closure object. In summary, a lambda is an abstraction that has many concrete representations. Guile will choose the cheapest representation that it can. If you need to eke out even more performance from your program, having a good mental model of how the abstract maps to the concrete will help you know where to focus your efforts, and what changes might be helpful. Good luck, and happy hacking! Thanks for this post, Andy. It drives me crazy when people talk about "closures" as a language feature. It's an implementation technique. "Pass a closure" is a category error. (See my first response at http://lambda-the-ultimate.org/node/2009). Just say "pass a function". You know, if one person, just one person, does it, they may think he's really dangerous and they won't flame him. And if two people do it, in harmony, they may think they're both Perl hackers and they won't flame either of them. And if three people do it! Can you imagine three people loggin' in, singin' a bar of ``Alice's Usenet Flame'' and loggin' out? They may think it's a re-implementation of sendmail! 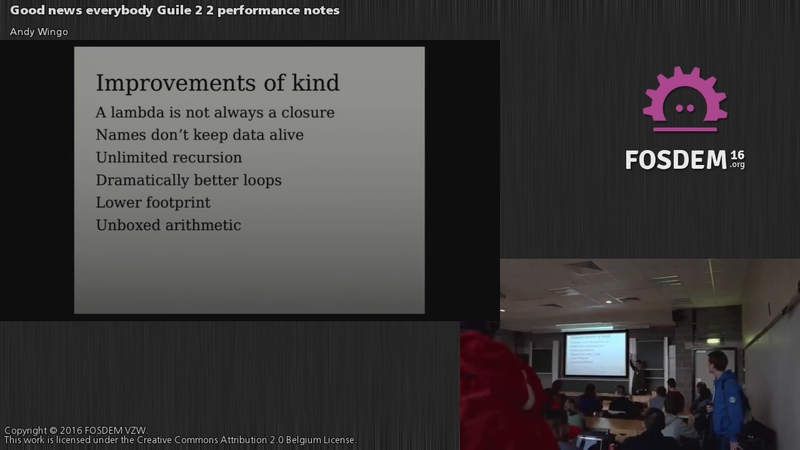 Kevin: Okay, but "first-class functions with lexically-scoped free variables" is a bit of a mouthful. Thanks for your talk! I have learned scheme (using guile) for one year now, I would love to learn how compiler works in general. IMO, scheme is the perfect language since it has no awkward syntax to worry about, everything is a s-exp. I am going to watch the video now! One thing though, could you provide the video in webm format as well? As we know mpeg-4 is a patented format, I really preferred the patent-free webm format (https://www.fsf.org/news/supporting-webm). Thanks again. Major flooding had ravaged parts of the city leading to water damage Atlanta services going up and running. Repair services are required to get the system back in order as it can cause fatalities among the people living in Atlanta city. Damages due to water can cause severe damages to houses and home owners are forced to take the help of experts to get the repair work done. When you notice basement flooding, you may feel depressed and to deal with such situation is devastating. However, hiring the best water damage experts is the best solution to protect your residence from secondary water damage and to sanitize the flooded thoroughly. Meanwhile, you can take some initial steps to protect your home from further damage. Read on what you can do when you notice basement flooding. Hello, i read your blog occasionally and i own a similar one and i was just wondering if you get a lot of spam responses? If so how do you reduce it, any plugin or anything you can recommend? I get so much lately it's driving me mad so any support is very much appreciated. Useful info. Fortunate me I discovered your site by accident, and I'm stunned why this coincidence didn't happened in advance! I bookmarked it. If you are like most people you believe fatigue or loss of energy is a result of age. Your absolutely right, left unattended your body naturally slows down. The key is in understanding our body and how it works. As we get older our body slows down the production of many enzymes necessary to maintain the level of energy we desire. An EBT card is a card which can be used in the grocery stores and supermarkets to buy food. This card is a way in which the cash and food assistance benefits for low income families who qualify receive their benefits. But how to get an EBT card is the often asked question. To get the EBT card you have to qualify for SNAP benefits. Quitting smoking is a lot like solving Rubic's cube, almost impossible when you don't know how, but straightforward when you have the right strategy. Learn why the heavily advertised methods like the nicotine patch and stop smoking medications often fail, and why Hypnosis, a method that is often discounted gets results. Web hosting is one of those essential services that you need if you plan to make some money with Internet marketing. Whether it's for your blog, salespage, membership site or squeeze page, they all need a place to live, and that place has to be extremely reliable so that it's available 24/7 around the world. Obviously it follows that if your website is unavailable it can't make you any money - not to mention the effect it will have on your search engine rankings. Unique gifts for dog lovers cover a broad range of items from coffee mugs, to picture frames, to bumper stickers and beyond. Our pets, especially dogs, are looked at as an extension of our family, and because of that unique bond that people develop with their pets; it usually goes hand in hand that people seek out unique gifts. This article will specifically explore some unique gifts for dog lovers of the world because let's face it...some of the dog owners out there in the world treat their dogs like or better than their children...I hope not too many...but if not for those relationships we have with our pets there would be no need for such gifts. Now to the list. Curo Hypnosis Toronto wellness and betterment via hypnotherapy to help overcome bad habits and addictions,anxieties and stress, weight loss,or enhance personal or career performance. General Hypnosis, EFT, Reiki, Beam, Virtual gastric band, Mindscape, Healing and more, all treatment methods tailored to each individual's wellness or betterment needs. Playing chess from an early age helps children develop healthy mental skills in the areas of concentration, imagination, problem-solving, planning, decision-making etc. Naturally, academic performance improves as also the ability to cope with challenges in life. Programming is a skill and everyone cannot handle it with smartness. I appreciate the programmers who had build so many helpful things for us. Well, i am searching for some health tips regarding my pregnancy week 6 ultrasounds and the foods that could be eaten in this situation. We have seen many connections in our lives, but some leave eternal marks. I am talking about love connections. I've never understood the mammoth power behind them. How come a person is your "heart and soul" within days, and you are just all crazy for him or her? I mean, what is the real issue here? Questions like this, are never ending- I see couples falling in love, connecting in bonds so pure and strong, making vows of loving each other in sickness and health and many such pick up love lines that have been used for many centuries. Still, it is unpredictable as well. The name of the game in Forex trading is predicting the movements of the Forex market. Whoever can answer the question "What will the EUR/USD do next?" is sure to make a nice bundle. When you leave good comments on blogs that are niche related to your business, there are possibilities that most readers from those blogs may be people who are already interested in your products or services. Those good comments you left could entice them to click on your link and interact with your website. through this way, you could get a lot of good traffic from those blogs especially if the post keeps having a lot of traffic. This could really help boost your traffic and conversion rates. North Korea says its plan to fire four missiles near the US territory of Guam will soon be ready, as a war of words with Washington intensifies. So you are searching for the best Google ranking tool with which can determine your website rank on Google, This article will help you find the best tool. Finding the right tool is one of the most important tasks to check the website Google rank or position. This gives you an idea of how all your efforts of SEO, link building etc. are giving results. The selection of the tool should be based on various factors and the tool should take in to account many recent changes that have been done on Google in last 1 year or so. Read ahead to find out what are these changes and how to find the best Google ranking tool. In the end you can look in the resource box below to find an awesome tool which takes into account all the recent changes (described below) on Google. When you notice basement flooding, you may feel depressed and to deal with such situation is devastating. We are providing best quality at a cheapest price which can’t meet any other company. Along with we have 100% money back guarantee. Our only demand is to make sure our customer feels fully satisfied with both products and services. This is what makes Best SMM Services best in the business. Cool beds in cheapest price. Woww!! If pay by mobile casino table games is not really your cup of tea you can always enjoy playing the range of slot games that are on offer. Just like table games, players can get spinning the majority of pay by mobile casino slot games from as little as 1p per spin! This all depends on what slot game you have chosen and you will want to be looking out for games that do not have fixed paylines if you want to play from 1p. Fixed paylines simply means that you have to play all of the possible paylines in a spin. However, this can still be as little as 20p per spin you are more likely to take home a bigger cash win playing this type of slot game! Since 2012 this institute doing very confidently their job to create a competitive field in global market of outsourcing. Because of gradual increase of unemployment, huge number of educated youth are remain jobless. They are moving here and there for searching a job. Negativity and depression push themback. Under this situation ONE DIRECTION found like ‘light at the end of the tunnel’. Dedication and professionalism make the institute unique. netStar Hammer Tactics for iPad is the explosive new iOS release of the PSP Minis sci-fi hit.http://downloadtorrentfromsadie.online (A database featuring over 10,000 random and abstract images. There is no question that backlinks are still a very important factor in getting a website ranked highly on Google, but getting those backlinks can be a long and drawn out process. Of course, you could pay for backlinks on sites like SEOClerks, but here are some ways that you can generate free backlinks to your website naturally. Luxury can be broadly defined as possessing items that are desirable but not essential and expensive to procure. It's a good game but in the races and events category can you add more minion races and time attacks please? Thanks I hope you make this change soon! Now you would expect a car with a 3.5 V6 under the bonnet to have a bit of poke, and that is before you add in a bit of add in a blast of battery power. Lexus rx hybrid quotes a 0-60mh time of 7.7 seconds and onto a top speed of 124mph. About fortune telling, many people get a lot of query of the difference from traditional precognitive psychic readings, or mediums, or clairvoyant abilities over all. Learning grammar is not an easy task and especially a novice has to struggle a lot by going through various sources to improve upon this skill. So grammar checking software is pre-requisite to accomplish this essential task. Still here you can play Google ghost in HTML on smartphone, pc or tablet. Some of these ghosts are: Mario ghost, ghost flash and sonic. Many from as like to play board games, even adults.Play most of popular and skilled board games,up to 48 of flash and HTML board games such as: backgammon, checkers, chess, item connect, butterfly match and fly, solitaire cards, alchemy towers,skill match forever etc. Super Mario in 3D.Today, Super Mario games come in 3D. Entire worlds are being built and the little character can explore these interesting worlds. The concept remains pretty much the same. Super Mario should still look out for tortoises, and passing mushrooms can still help him grow up.rnrnStill, despite the evolution of the Super Mario game, some players prefer playing the game in 2D. The game has been revived by game developers, and you can now play classic Super Mario games for free online. There is no need to register. All you need is a browser with an internet connection, and lots of spare time! home appliances (blender, rice cooker, induction cooker, air fryer, rechargeable fan, air cooler, hair dryer, DVD players etc. ), LED lights, battery, electric motor etc. Walton mobiles are one of the most selling products of Walton Micro-Tech Corporation and also is one of the best selling mobile brands in Bangladesh. Happy birthday from my part too.Very useful article,shows articles are one of my favorite,thanks.For nice and quality games online. Good to know more things about lambda. Play unblocked games anywhere at school ,work or at home.This website use last tehnologies to accessed from anywhere to enjoy cool math games on any operating system and any browser. In the past, the games was very easy to play it,now as much as we go ahead more levels are added and become more harder to complete them. Article very informative.Play Mario Bros unblocked games anywhere at school, work or at home. This is required by the car removal companies in Melbourne, and also by the Road Traffic Authority. So if you are preparing for your car to be removed, there are a number of considerations that you need to keep in mind. SEO experts purchase expired domains for their backlinks. Everyday 200,000+ domains expire and it is virtually impossible for you to go through the backlinks for each of these domains. The information you shared helped me better understand the lambda. Three series are waiting to be announced which are ranging from 53 inches to 63 inches. The plasma HDTVs that are 3D enabled are the series 8000 and series 7000. This website is really nice to surf on, great job. I am a happy person today, and I think that you may know the reason, because you are the reason. Your work has made me one of the happiest person alive, and I hope you continue to produce more content that's as good. This post provide me useful information, i learn something and this is a great thing. visitez notre site pour plus de renseignements.